As we planned for this trip so many months ago, a thought crossed our minds; the same thought that crossed the minds of the Roman Empire in the fourth century, the early Arabs in the eighth century, and The Clash during a cocaine-trip in the early 1980s: wow, it’s really not that far from Spain to Morocco! 1.5 hours by ferry, in fact (though I’m sure it took a little longer for the Romans), was all it took to get our feet on African soil. Now, some will say that Morocco is not the ‘real’ Africa, which is the equivalent of saying that Mexico is not the ‘real’ Latin America. Yes, parts have been tamed into resorts teeming with tourists, but most areas remain unscathed as very hot, very hospitable, and very African. 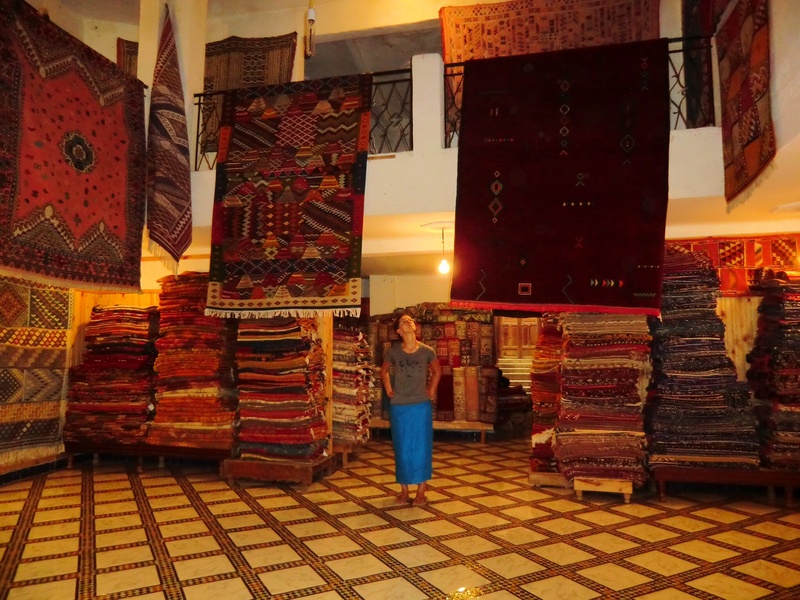 From the port in Tangiers, we sweated our way to the train station, where we had two hours to wait before our train. I went on a scouting mission for food, only to find that this train station was located in the utter middle of nowhere. The only signs of human activity within eyesight was, in Douglas Adams non-sequitur fashion, a carnival. Tilt-a-whirls tilted and whirled while carnies tried guessing people’s ages for money. Surely, I thought, there must be food in this peculiar desert oasis. 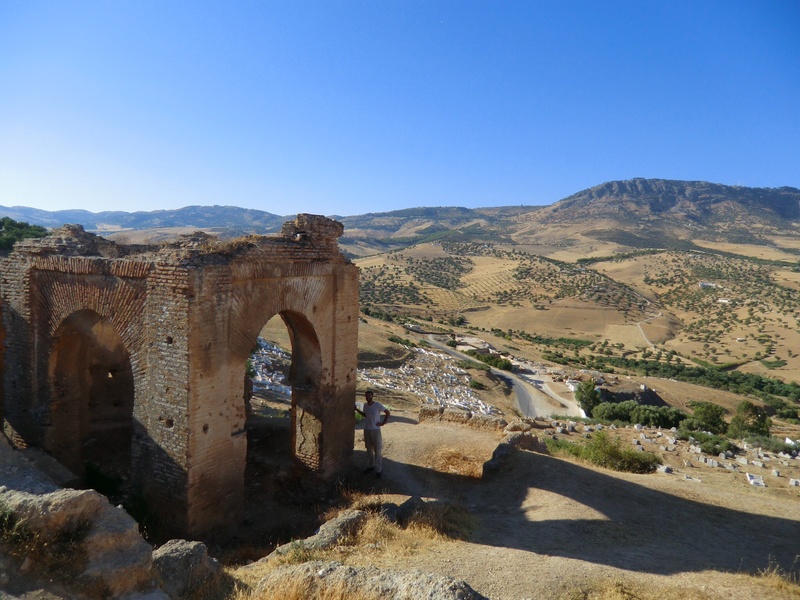 It was here that I got my first sudden awakening to the linguistic reality of Morocco. 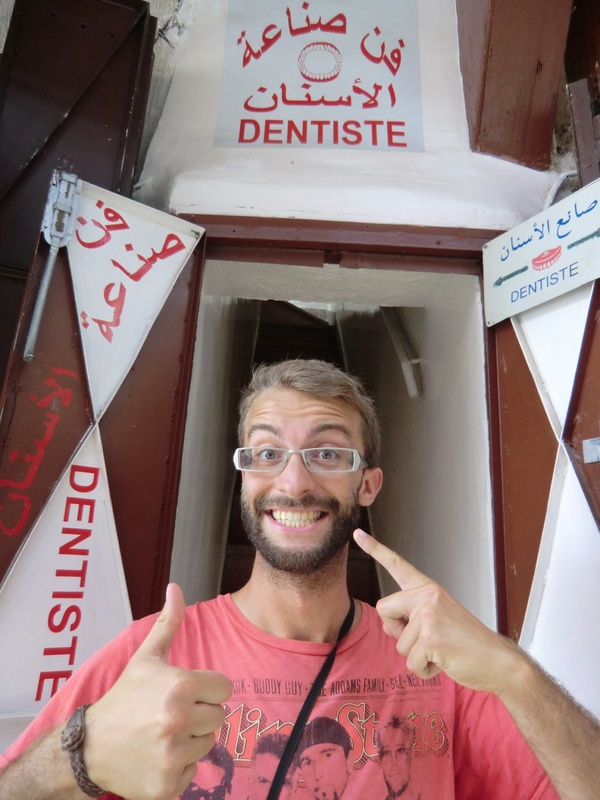 Despite French being one of two official languages and despite being spitting distance from Spain, many Moroccans only speak Arabic. 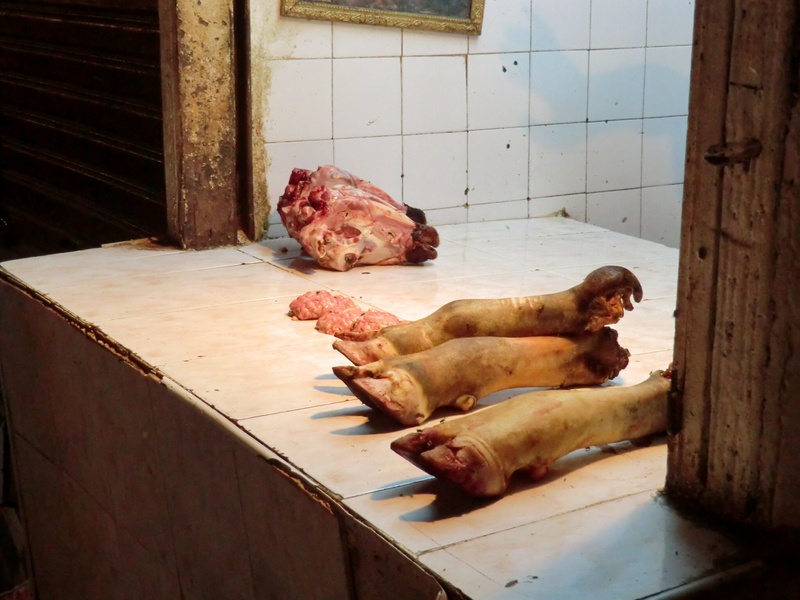 I gestured helplessly, using the only Arabic word I knew (‘shukran’, taught to me by the Pakistani lady working at the corner store by our apartment in Winnipeg) to hunt and gather a good meal. The result: two boiling orders of snails deep-fried in cardamom (the word for escargot seems universal, fun fact!) in a plastic grocery bag which I watched melt to oblivion before my eyes. Fortunately the snail-chef managed to get a couple reinforcement bags over it just in time, and I carried the loot back to Sara, who was waiting patiently with our backpacks. 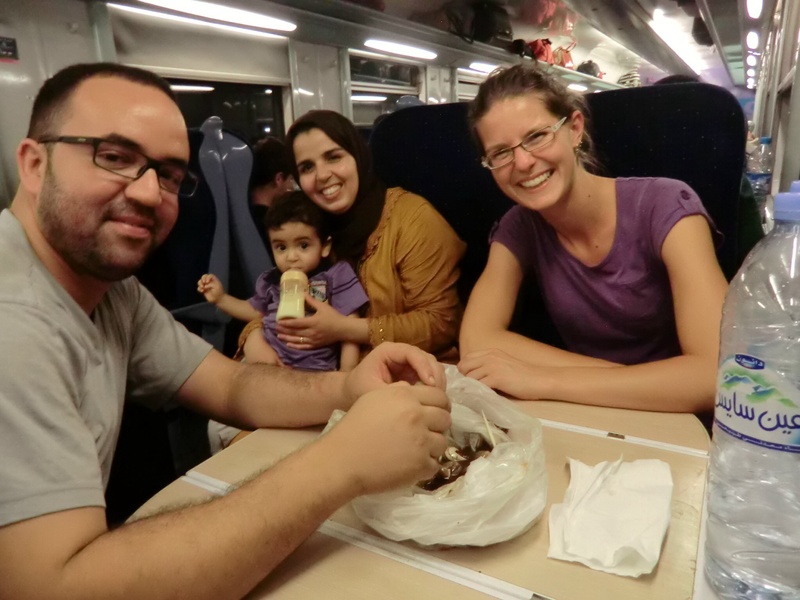 The train from Tangiers to Fez, with our boiling bag o’ snails, serendipitously shared with the friendliest family we could’ve imagined sitting with. Hind, Nourd, and their son Adam made us feel incredibly welcome in Morocco, and even insisted that we visit them back in Tangiers the next week. Alas it didn’t work out, but la prochaine fois! 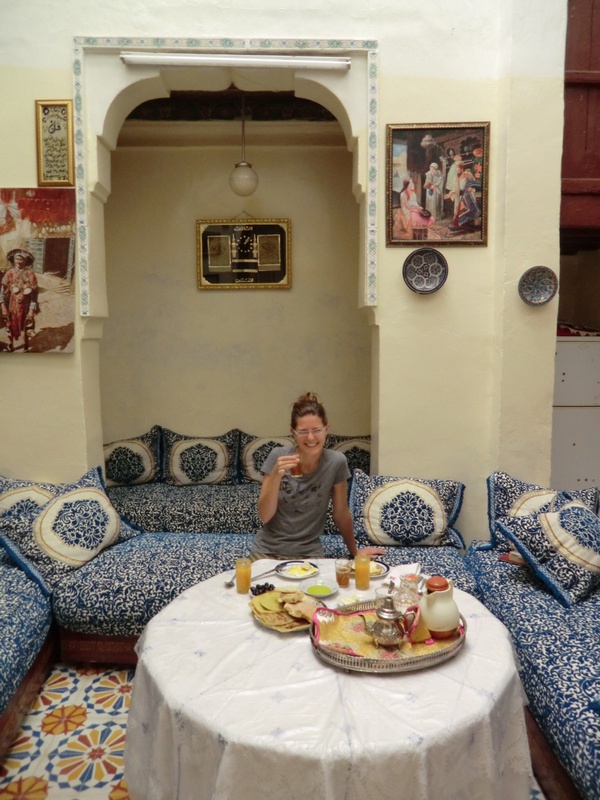 We arrived at our riad in Fez late at night, where we were informed that they had no room for us, despite having made reservations. Any annoyance we felt at having to move was immediately assuaged when they said it was because the previous guests had left bedbugs, and we agreed to follow one of the employees to what we vaguely understood to be the home of some relatives of his. And so, keeping our safe-traveller wits about us, we followed the riad employee into the Fez Medina: the old walled-in city, built by Arab settlers moving west in the eighth century, which consists of 9,400 snaking alleyways and remains to this day the largest car-free urban center in the world. 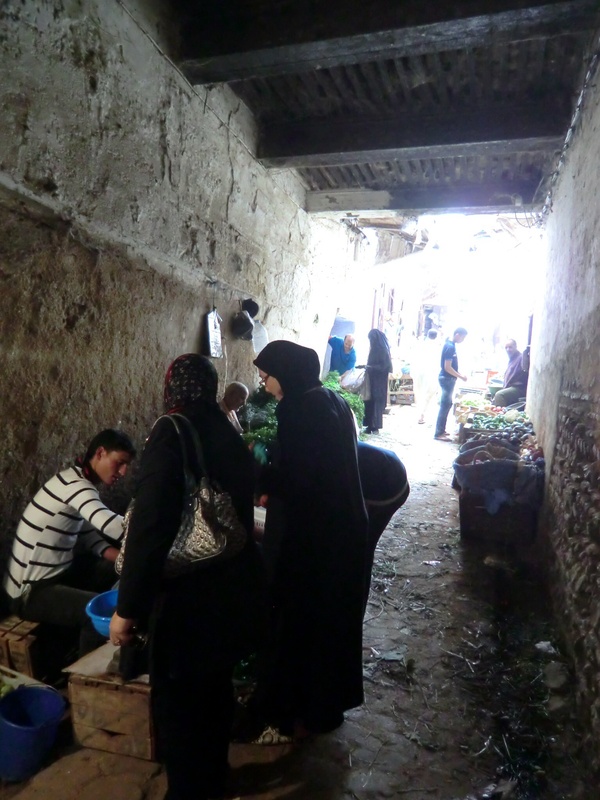 Eventually, and with no recollection of the route we had taken, we arrived at the home of the Samnoun family. Dehmo and her children Boshi and Carmina welcomed us with the traditional mint tea, and we found we had nothing to worry about. 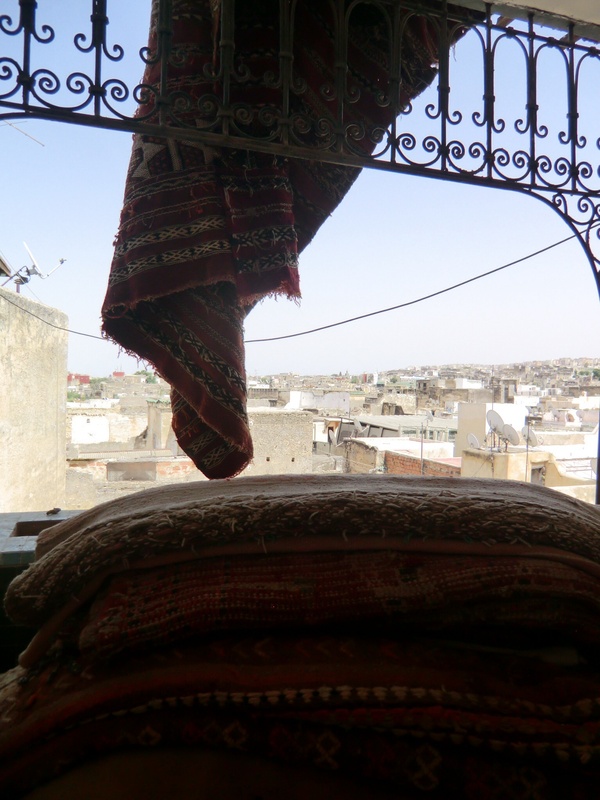 An ordinary family home in Fez. Amazing what a little colour and simple Arabesques can do to a place! The street of the Medina immediately outside our front door. 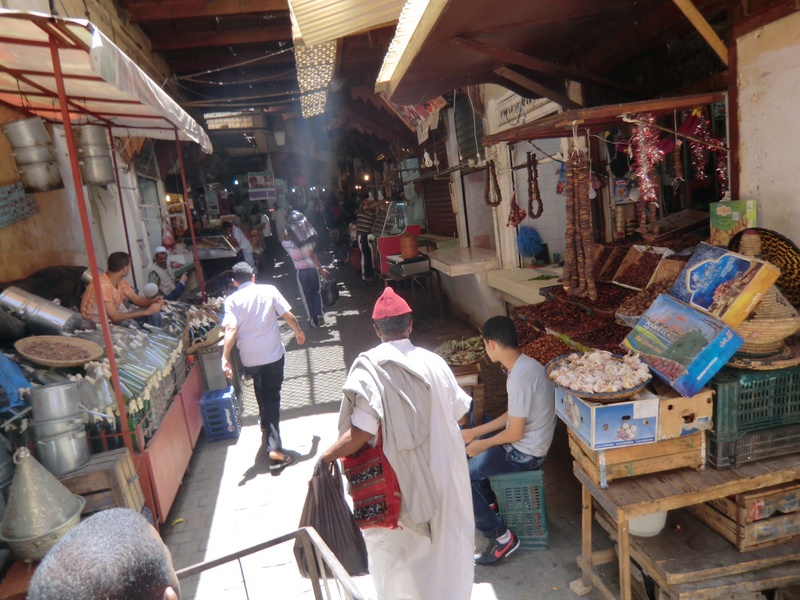 A man wearing a fez…in Fez. 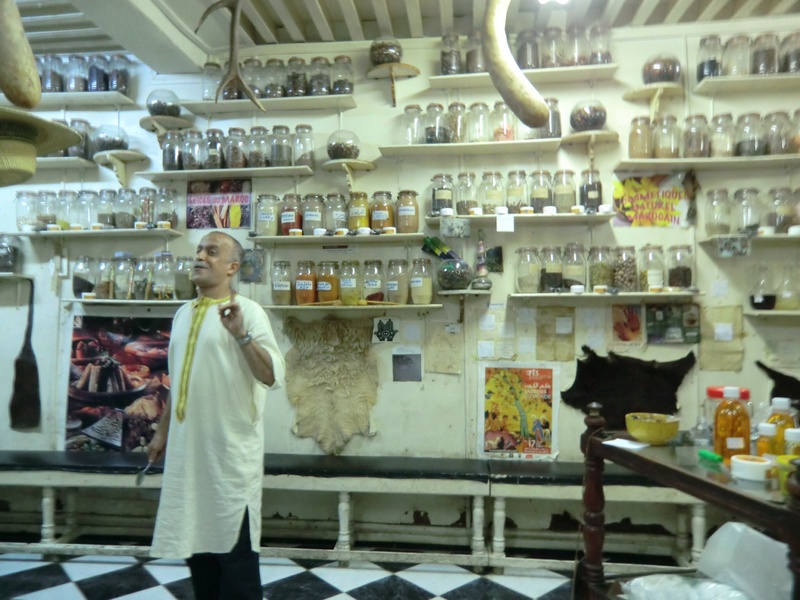 One of our landmarks: the goat brain shop. 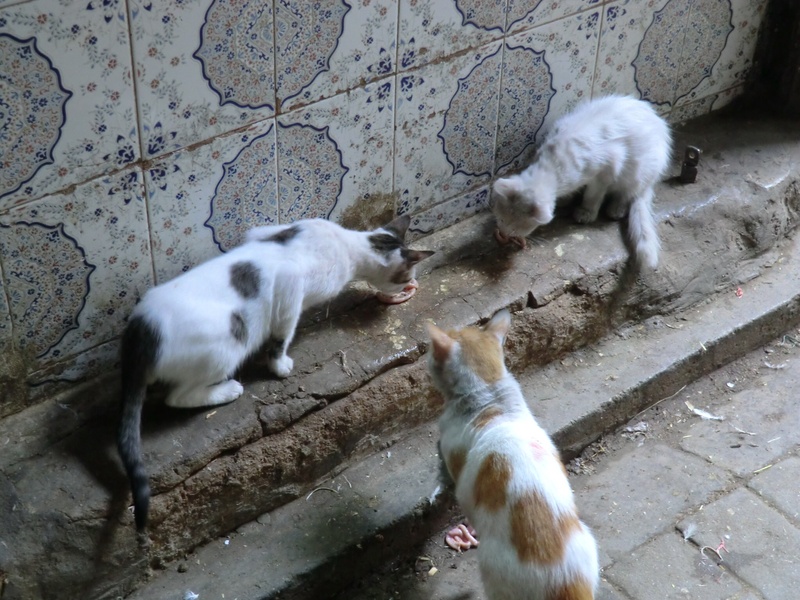 Kittens and cats are plentiful in the Medina, staying nourished on bits of gizzard dropped by various butchers. 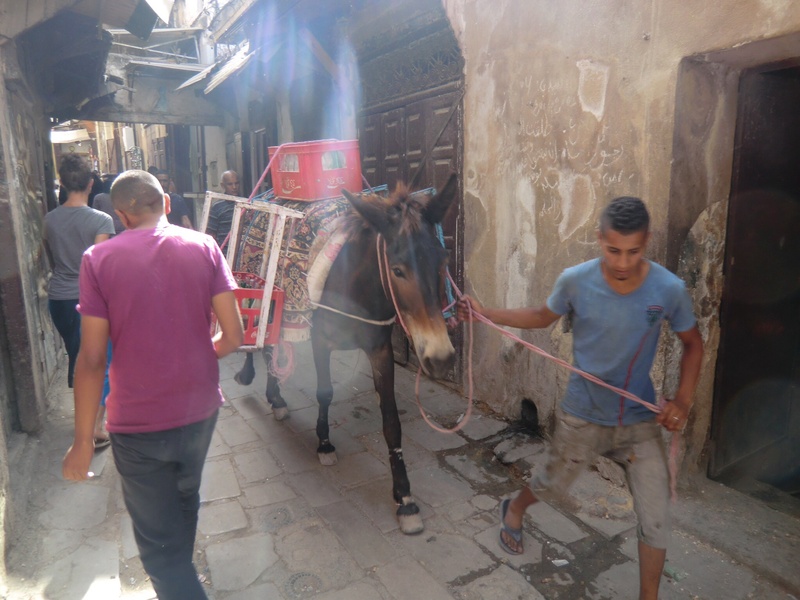 Though a few folks try to carry their goods by motorbike, the crowds and random staircases make mules a much more viable means of transport. 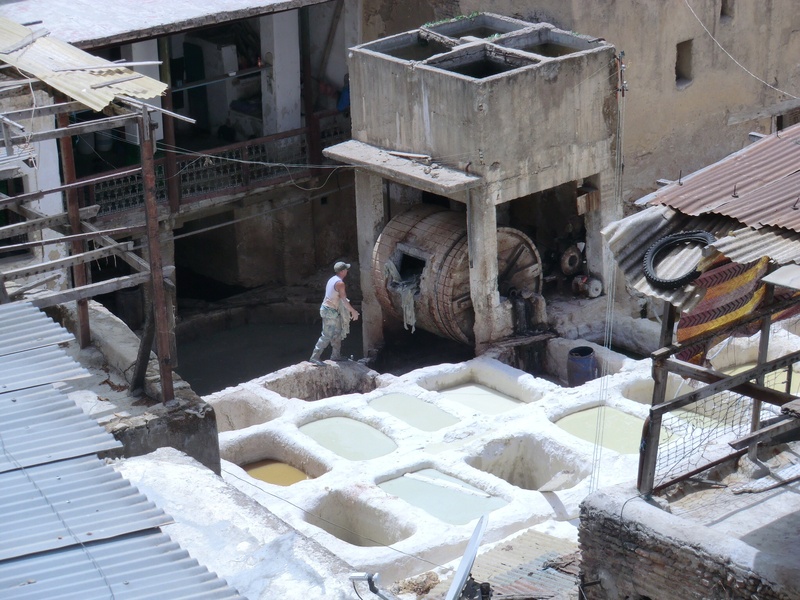 The tanneries, where locally sourced cattle hides are washed and dyed in huge, earthen pits following 1200-year old traditions. 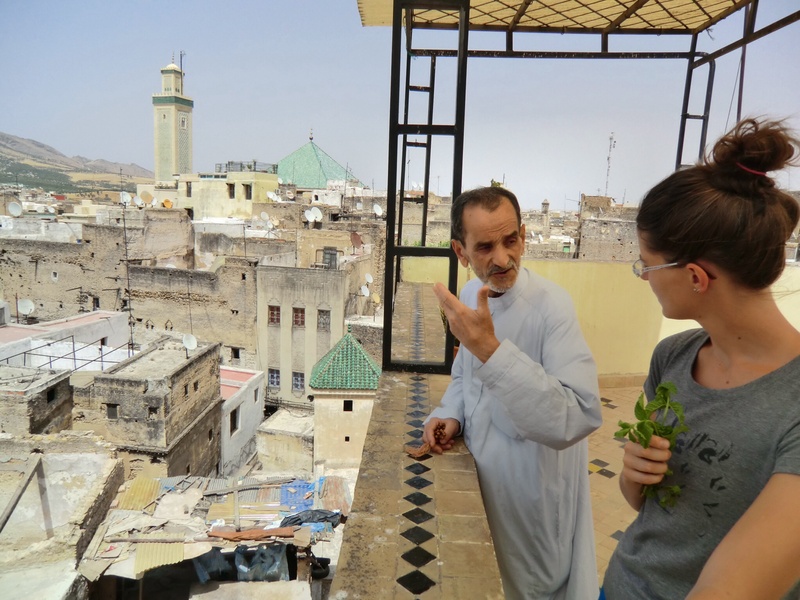 A tannery worker explaining the whole natural process to Sara, while she holds a complementary sprig of mint (which valiantly attempts to distract the viewer from the stench of pigeon caca, whose natural ammonia is used to bleach impurities from the hides). 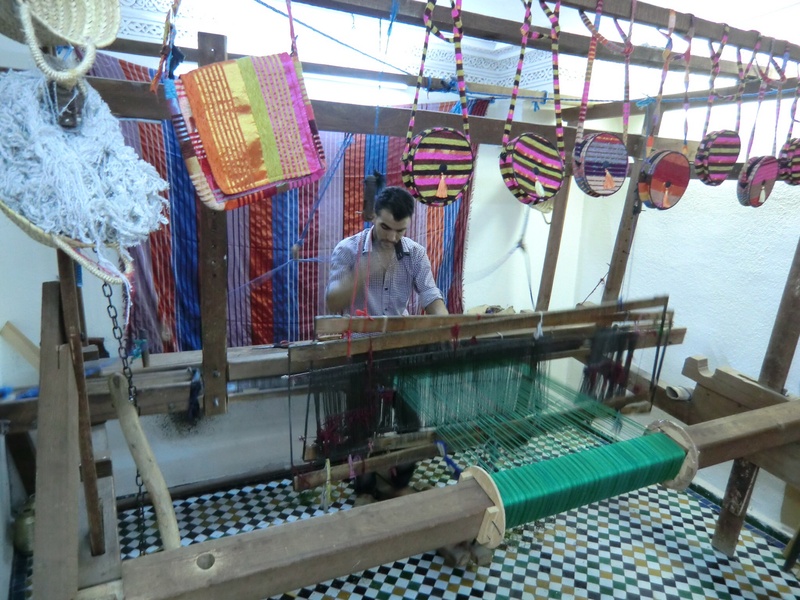 A curtain-weaving co-op, slightly lighter and more affordable than the carpets and, coincidentally, something we were actually looking for for our bedroom! One of the more entertaining spice shops (this story is better told in person) where we loaded up on all kinds of things we had never heard of before, and hope we don’t have to declare at customs. And Grandpa, if the Mexican dental job ever proves faulty, we’ve got the place for you! 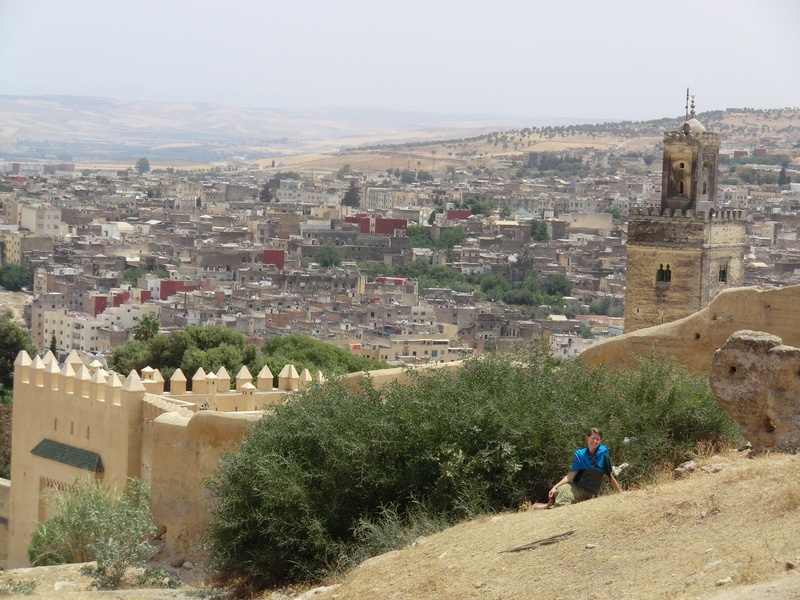 Ancient tombs of bygone sultans that keep watch over Fez. The pristine clay walls that barely contain the bustling labyrinth within. We walked a beautiful quarter of the way around, before the blistering sun drove us back into the (well-shaded) bedlam. Truly an incredible place to spend three chaotic yet schedule-free days. One last story for the road. Most of our meals were eaten in the restaurants that form the ‘dining district’ of the Medina, which, despite the majority of cooking utensils being shared between the many establishments, do seem to resemble what we might call a restaurant (complete with chairs, menus, and beverages that come in cups). For our last supper, however, we were intrigued by a scruffy young chap who called to us from behind a glass case of condiments, “My friends, come eat!”. Though we could not tell what it was he was serving in his four-foot-by-four-foot kiosk, we agreed. He seated us on a bench behind the condiment case and immediately slapped his coffee cup, of which he had already drunk half, on the wooden table in front of us, saying “Welcome!”. He procured some eggs out of nowhere and began whipping together two omelettes on a propane grill in the corner. When asked what we wanted to drink, Sara said tea, which was a simple enough request. My Coke, however, required a few extra steps. 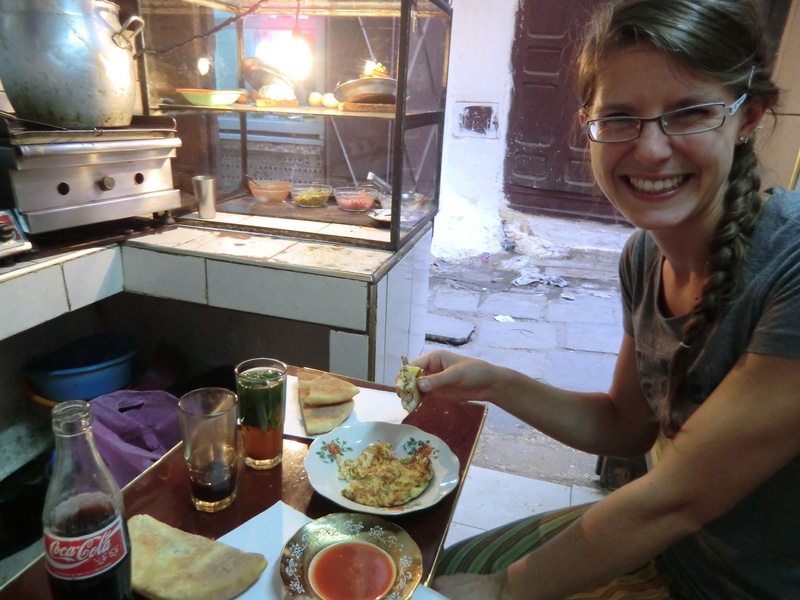 Our chef extraordinaire called to his buddy outside, handed him a used glass Coke bottle, and said something in Arabic. The buddy ran off with the bottle, returning a few minutes later with the same bottle, now full of Coke, and with a cap that had somehow been squeezed back onto it. Lacking a bottle opener, I employed Uncle Jim’s edge-of-the-table strategy. A slight corner of the table broke off, but the management didn’t seem to mind. Overall a memorable dining experience. 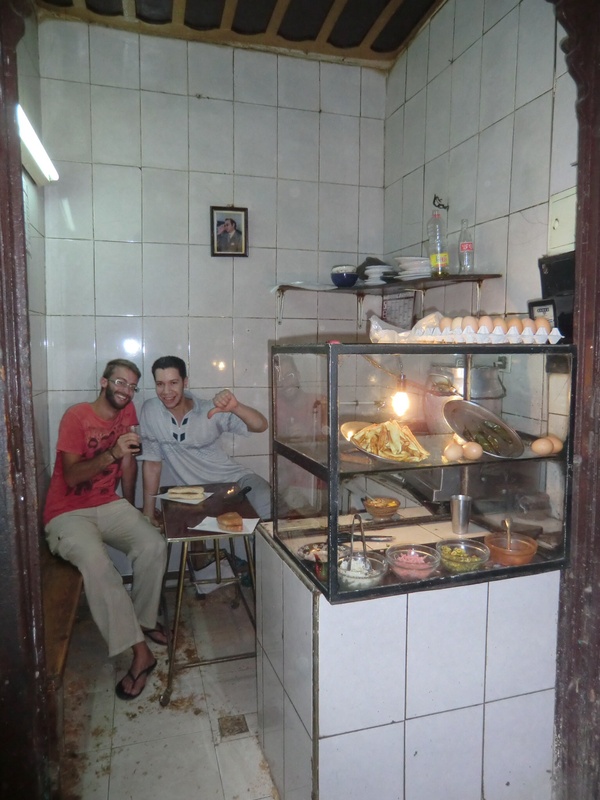 The coffee was thick and Turkish-style, the omelettes delicious, and the service extraordinary. Highly recommended, if you can possibly find it. 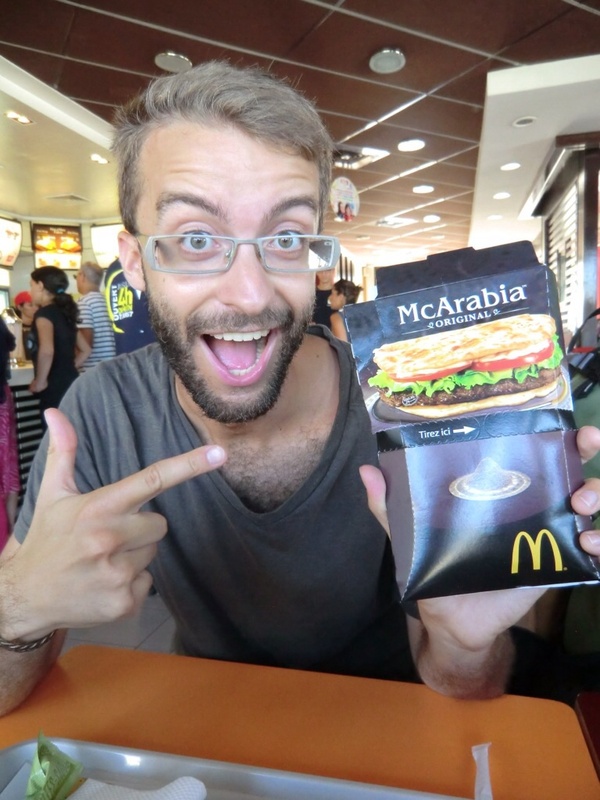 Afterword: Finally, a taste of home. Well, kinda.